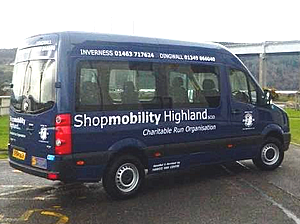 We are members of the Community Transport Association and Shopmobility Highland operate two minibuses, one operating from Inverness and the other operating from Dingwall. The Inverness minibus operates Monday to Friday and concentrates on Inverness City and surrounding areas. We pick our members up from their home and take them to the City centre for shopping and then take them back home. On arrival at the City centre ,which is generally at one of the supermarkets we can have a mobility aid waiting for use and we can even provide a volunteer to assist with the shopping. Monday – (every second Monday) Easter Ross, Dingwall and surrounding areas to Inverness and back home and each alternate Monday it covers the Drumnadrochit area to Inverness and back home. Tuesday – Culbokie, Fortrose, Rosemarkie, Avoch and Munlochy area to Inverness and back home. Wednesday – Every second Wednesday covers the Nairn area to Inverness and back home. Thursday – Local runs within Dingwall area. Friday – Local runs within Dingwall area. The cost to our members for the use of our minibus is £8 donation per return journey irrespective of which service they use.